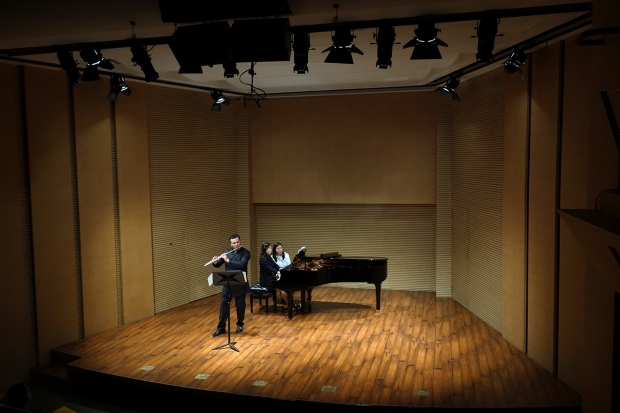 Prof. Dejan Gavric of Hochschule für Musik Mainz and 2nd-year student So Young Choi perform duets from Mozart’s “The Magic Flute” at last night’s German School of Music Weimar Masters & Students Concert, Seoul Baroque Chamber Hall. 3rd-year flute student Sun Min Yang performs Reinecke’s Sonate e-moll, Op. 167 “Undine” with piano accompanist Hyun Ji Yoo at last night’s German School of Music Weimar Masters & Students Concert, Seoul Baroque Chamber Hall. 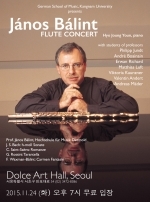 Prof. Dejan Gavric of Hochschule für Musik Mainz and 3rd-year student Jean Sil Jung 정진실 perform duets from Mozart’s “The Magic Flute” at last night’s German School of Music Weimar Masters & Students Concert, Seoul Baroque Chamber Hall. Clarinet students Lee SunHo (3rd-year, right) and Dong Ha Yu (2nd-year) perform Poulenc’s Sonate für zwei Klarinetten at last night’s German School of Music Weimar Masters & Students Concert, Seoul Baroque Chamber Hall. Prof. Dejan Gavric of Hochschule für Musik Mainz performed Taktakishvili’s Flötensonate C-Dur and Taffanel’s Fantaisie sur le Freischütz de Carl Maria von Weber with piano accompanist Eunyul Heo at last night’s German School of Music Weimar Masters & Students Concert, Seoul Baroque Chamber Hall.
. Your favourite juitofscatiin seemed to be on the internet the easiest thing to understand of. I say to you, I definitely get irked while other folks consider worries that they plainly do not know about. You managed to hit the nail upon the highest and defined out the whole thing with no need side effect , people can take a signal. Will probably be again to get extra. Thank you! Great info 🙂 Still, there is something I cannot understand, when I make a new post in my FB Page I cannot see it in my personal timeline and I have noticed that other people who have already liked my page do not see that post either. Any idea why this is happening.Thanks Christy!